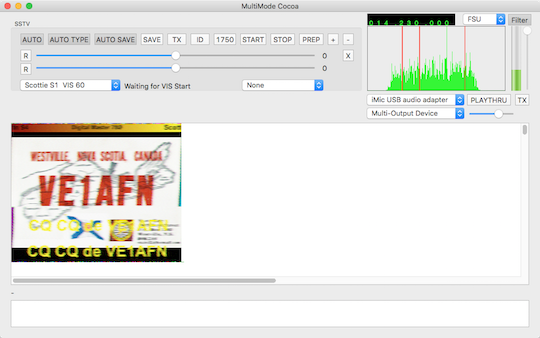 MultiMode Cocoa has been updated to version 6.7.5, with several improvements to SSTV mode, as well as adding tooltips to all of the modes. It runs on Mac OS X 10.6.8 through macOS 10.12 Sierra. MultiMode allows you to decode and transmit morse code (CW), RTTY, FAX, SSTV, SITOR-B, NAVTEX, PACKET, ACARS, PSK31, ALE, DGPS, ALE, and many other modes on your Macintosh, without any extra hardware. Just connect your Mac to your radio, and you're all set to go.